This is Book 3 of The Fall of Eldvar. I reviewed Book 1, In Wilder Lands, here in March 2012, and Book 2, Into the Desert Wilds, in November 2012. Those were a two-part subseries, “the wildling story arc”, within the larger saga of The Fall of Eldvar. 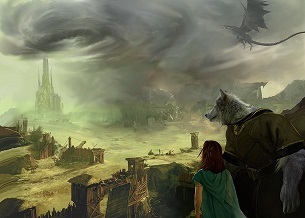 Galford said on his website that Book 3 would feature new characters, an elf and a human; and no wildlings (furries). 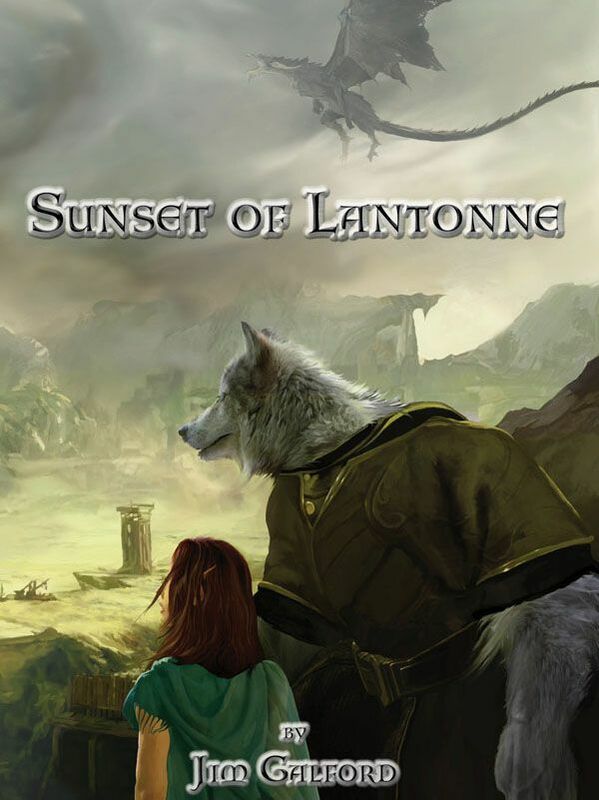 Yet Darryl Taylor’s cover for Sunset of Lantonne clearly features Raeln, a seven-foot tall wolf wildling, with Ilarra, his elf “sister” by his side. Did Galford lie? Not exactly. The main characters in Sunset of Lantonne are Ilarra, the young elf wizard-in-training, and Therec, the older human Turessian necromancer. Raeln is only a supporting character – but you woudn’t guess it from this cover. Or from the first chapter, which plays up Ilarra and Raeln. Galford debuted Sunset of Lantonne at Rocky Mountain Fur Con 2013. Featuring a furry on the cover was a good marketing move. And a justified one, if it will get furry fans to read Sunset of Lantonne. It is an excellent novel; Raeln is a memorable character even if he is not the star; and there are plenty of wildling incidental characters. Read it; you will not be disappointed. Also read Jim Galford’s website, especially if you have not read In Wilder Lands and Into the Desert Wilds yet. It contains a tremendous amount of background information on this series. Seattle, WA, CreateSpace, August 2013, trade paperback $14.99 (545 pages), Kindle $3.99. Edited by Tricia Kristufek. The protagonists of Books 1 and 2 are the wildlings Estin, an anthro ring-tailed lemur; Feanne, a red fox; and Feanne’s cubs, Oria and Atall. The setting is initially the Dutchy of Altis during its generations-long war against the Kingdom of Lantonne, and later the fennec-ruled desert city-state of Corraith; the plot is the conquest and destruction of both Altis and Corraith by the necromancers of Turessi and their armies of zombie-ghouls. Lantonne is in the background in the wildling story arc, just mentioned as Altis’ invulnerable enemy. Sunset of Lantonne is not really about the events in Altis or Corraith; therefore having read Books 1 and 2 is not required. Ilarra is introduced as a young (26; about 17 or 18 in human years) elven magic student in the small farming village of Hyeth. She is notorious for being a powerful but sloppy student, so nobody can guess why she is selected by the tower of magic in Lantonne, a wizards’ college, for advanced training. She will go to Lantonne alone; but of course this does not mean without her “brother”, Raeln the wolf wildling. Raeln does not talk, but he is expressive in pantomime. Sunset of Lantonne, as Into the Desert Wilds before it, is told in alternating chapters, as the young and naïve Ilarra and the more mature but still innocent Therec come from their very different isolated cultures to the urban metropolis of Lantonne. Ilarra is looking forward to getting away from the small-village atmosphere of Hyeth into the Big City, learning to become a master wizard and also, hopefully, discovering Romance. The more restrained Therec, a Preserver (necromancer) from the rigid theocracy (for want of a better word) of Turessi, would rather study at home with his family, but he accepts being sent to Lantonne as an ambassador by Turessi’s ruling council. Lantonne is considering using magic to raise an army of the undead to fight the Altisians, who already have their own army of the undead, and has asked Turessi to send an expert necromancer to advise them. Therec is that, but he is unprepared for the morass of politics that he finds himself mired in among Lantonne’s aristocratic leaders – and worse. Though Raeln moved aside for the newcomers, Ilarra saw him adjust his footing, bracing himself to fight. He was giving them the benefit of the doubt, but preparing to kill them all if he had to. Coming around Raeln, two red fox wildlings in battered leather-and-chain armor hurried into the room, carrying shields and short axes. The man and woman pair had dried blood in patches across their clothing but moved with the stubborn determination of trained warriors. Both gave Ilarra a quick look and began searching the room for anything or anyone else. Apparently not finding whatever they were looking for, the two wildlings went back out into the hallway. … orcs, and others. The reader sees Lantonne’s lower classes, which include the wildlings, with Ilarra and Raeln, and Lantonne’s rulers and the aristocracy with Therec. They had gone perhaps three buildings when a black wolf – so large that, even running on all fours, it was larger than Raeln standing on two – darted across the road, faster than Ilarra thought possible. She froze as it disappeared between two more buildings, giving Raeln a nervous glance to see what he thought of the newcomer. She had never even heard of a ghost wolf, so this was new to her. Let’s hope that there will be more Eldvar books after this series is complete. They are GOOD! And with enough wildlings to please furry fans, whether or not they are leading characters. "I thought I would pass along something of interest to the community. I've replaced my previous cover artist with someone from within the community...none other than the wonderful Rukis. The current plan is that she will be doing the covers for books 4 and 5 of the series." Book 4 should be out just in time for RMFC 2014 in August. I'm sure that cover will be well-received! Rukis' being a fan-favorite will doubtlessly help for publicity, but there is nothing wrong with Darryl Taylor's excellent art. If all ducks are in a row, book four should hit Amazon and print in July, shortly before RMFC, where I'll be doing some talks. Book five is tentatively scheduled for early 2015 if all goes well. I thought Jim did an excellent job with character development and relationship in all three stories, and won't like, I choked up a little bit when one of the characters passed away. I'm not a big fan of the whole undead portion of the series. It just seems like zombies are everywhere at the moment, and it's becoming uninteresting. I honestly found the whole battle with the undead to be bland and boring in the third. I also wasn't a big fan of impossible it seems to kill off necromancers. I can understand if they're difficult to kill, but not impossible. I'd explain a couple of scenes, but I also don't want to spoil anything to those who haven't read it yet. I'm likely to check out future titles just for the character development alone. Sorry you're not a fan of the zombie horde. I do agree they seem to be popping up everywhere lately. Very frustrating for those of us who're stuck with a story mid-stride when zombies became mainstream again. While also trying not to give away anything, the necromancers are a bit "special." Any run of the mill necromancer in the Eldvar world would be no more difficult to kill than any other wizard. Turessian necromancers are something else entirely. Book three touches on that, with book four going into more detail. If you have any questions or concerns, feel free to shoot me an email (it's just inside the cover of the book) or hop on facebook and say hi.